Two dates to know: August 4, 2010 – the day Google enabled owner responses to Google My Business reviews; November 17, 2016 – the day Moz enabled incredibly easy GMB owner response functionality in the Moz Local dashboard. Why are these noteworthy events in Local Search history? Because reviews and owner responses are direct reputation management, free marketing, free advertising, damage control, and quality control all wrapped up in one multi-voice song about your brand. What’s missing from the picture of this free-for-all of voices caroling sentiment about your brand? You are — the conductor! If you’re not leading the tune — from setting customer service policies, to training staff, to managing complaints, to engaging directly with consumers online — you’re giving up available reputation management controls. Make no mistake: No brand can prevent every sour note, but with owner response functionality, you can not only retune relationships with valuable customers, but can also protect revenue by keeping those customers instead of having to invest 25x as much in obtaining new ones. Owner response mastery is, indeed, smart business. For the past six years, since Google launched owner responses as part of its local product, I’ve been studying them and acting as a consultant to a variety of local business owners and agencies regarding effective usage of this remarkable capability. Today, in celebration of Moz Local’s support of this function, I’m going to break down the types of reviews into 5 categories and offer you my tips for skilled management. With reputation and revenue on the line, every local brand needs an intelligent strategy! During our recent launch, a Moz community member let us know he’d never heard of owner responses before, so real quick: Many review platforms give you the option, as the business owner, to respond to reviews your customers have left you. This is normally done from within your dashboard on that platform, or, in some cases, via mobile apps. Now let’s delve into responding to the five basic types of reviews most local brands can expect to receive. Diagnosis: This is the customer every brand wants to have: the delighted evangelist who goes to the lengths of saying that nothing else on the local scene can compare to what the business offers. Honestly, reviews like this are like beautiful greeting cards validating that your business is getting it right on all points. Pure music to your ears! Many business owners ask if it’s necessary to respond to positive reviews. My short answer is yes, if you wish your business to come across as courteous and engaged. Part of conducting the flow of your reputation is acknowledging customer satisfaction and thanking them for the time they invest in writing such nice things about your company. It’s just good manners. Having said this, I’ll qualify it by mentioning scale. If your enterprise has 100+ locations which each have 100+ positive Google My Business reviews, responding to every single one may not be the best use of your resources. Prevent the appearance of ungrateful neglect by aiming for a percentage — maybe 10% — of ‘thank yous’ in response to your best reviews. Your thanks can be brief, but avoid repetitiousness. Write a unique response each time. There are owner response profiles out there that have made me strongly suspect robots manage them, as in ‘thank you for your review’ written on 30 different responses. Avoid that. Remember that owner responses are content consumers read. They are, in essence, free advertising space. Don’t go over the top with this, but if a customer mentions something they love, latch onto that. In our sample review above, the owner could mention that comments like this one inspired them to bottle their hot sauce for retail sales, or they could mention that they actually just won a best-in-Bay-Area award from X publication. Think products, services, and hyperlocal/local terminology. No, don’t put the hard sell on the customer in the owner response, but use this real estate with savvy. If there’s something you think a happy customer would be excited to know, promote it in a nice, friendly way! Positive reviews indicate that a customer is already in a good, receptive mood. The more personable your owner response, the more of an impression your business can make, encouraging the customer to come back for more. Here, company culture, personality, and fun can shine. Your customer thinks you are special — act like it in the response. We were just thrilled by your review — in fact, we showed it to Chef Rosa, because the pique sauce you love is based on her grandmother’s traditional recipe brought from Puerto Rico in the 1930s. It’s the real deal, and we’re actually offering it bottled for retail now right next to the hostess stand at both our San Rafael and San Francisco locations, based on diner requests. Hint: one secret ingredient is apple cider vinegar, but that’s all we can say! We’d love to see you back soon, and Chef Rosa says, “Thank you for the lovely compliment.” ‘Best in the Bay Area’ makes us all proud! Diagnosis: A 3-star rating is the hallmark of the consumer who likes some things about your business, but isn’t totally loyal yet. They may/may not return and may/may not recommend you to others. Undecided patrons represent an exciting challenge to transform dissatisfactory aspects of your business and specific consumer sentiment, all at the same time. The honesty of a less-than-5-star review, when written in detail, delivers two valuable assets to your brand: it tells you where you’re hitting and where you’re missing, giving you the opportunity to improve and turn a lukewarm consumer into a loyal one. Strategy for the owner response involves thanking for praise, accepting responsibility for faults, apologizing for disappointments, and making some kind of an offer. This offer, meant to sweeten the pitch that you hope the consumer will give your company a second chance, could be a comp or a coupon for future use, or it could simply be an explanation of how you have heard their feedback and made changes. Express gratitude for consumer complaints — they are valuable. Do not attempt to shift blame onto anyone else, including the customer or staff members. Document both the positive and negative sentiment of so-so reviews and use it as your playbook for keeping what’s good and improving what isn’t excellent. Be sure the customer feels heard. Cite their complaints back to them. By doing so, you are demonstrating to all future potential customers that your brand is responsive to feedback. We’re so grateful to you for letting us know that our prices, staff, and in-hotel restaurants pleased you, and, I also want to express my thanks to you for mentioning that the housekeeping wasn’t exceptional. I need to hear that, and take full responsibility for the dusty room. I have been trying a variety of cleaning services this past year, with the goal of finding the best. While I want to be sure that every guest knows we honor any requests during their stay (just dial 9 on your in-room phone), I also want to let you know that, based on your comments, I held an all-staff meeting with our current cleaning service and have issued a new 10-point cleaning checklist (including dusting all surfaces) for each housekeeper. Should you honor us with a second stay, I personally guarantee you will find your room immaculate, and I would also like to offer your party a free breakfast in the Palm Room, as you enjoyed our restaurants. Just tell them Rob sent you, and it will be our pleasure to serve you! Thank you for your valuable and honest review. Diagnosis: The dreaded 1-star review! The customer has a specific, legitimate complaint, and your job as the owner is to address their dissatisfaction, take responsibility, and, whenever possible, make an offer to make things right. A negative review is likely the last life preserver an unhappy customer will throw you — a last chance to earn them back with superior responsiveness. Given the cost of replacing them, rewards for the effort can be great. When a customer ‘saves you’ by making their complaints known, an adept response from you may ‘save them’ in return, earning their repeat business. No blame shifting, no lectures — just total accountability, humility, and a willingness to learn. Be as honest as possible about whatever circumstance led to the customer’s bad experience, and state what you’re doing to improve that circumstance. Sometimes, the circumstances may include faults on the customer’s part. If you have to mention these in order to be honest, do so with great care and no blame, as in the sample response below. Negative reviews often run on for agonizing paragraphs and chapters, but your response should not. Be thorough, but concise. Offer something, even if it’s just a few minutes of your time on the phone, to try to make it right. Aim for a ‘wow’ factor — as in you want future potential customers to say, “Wow, this business really cares!” when they read the response. For more tips on managing negative reviews, please read Diagramming The Story of a 1 Star Review. Document all complaints; they are incredibly valuable both in terms of damage control and quality control. Consider doing a full review audit on a set schedule to catch emerging problems and resolve them. This is Dr. Tom, and I want to begin by apologizing for the inconvenience you experienced. I hate to think of you having wasted both time and gas on this. I’m so sorry. Updated our off-hours phone message to include the info that folks need to come in by 3:00 to ensure walk-in service. Will you give me a second chance to make this right for you? It’s so important that your pet gets proper shots. Please phone and let my receptionist know Dr. Tom is offering you a priority appointment, any day of the week, and I’d like to make friends with your pup by treating him to one of our wonderful new chew toys. Hoping to have the great pleasure of caring for you and your awesome companion animal! Diagnosis: Unfortunately, fake reviews happen. They may stem from unscrupulous competitors, disgruntled past employees, or individuals with personal grudges against someone at the company. The line to walk here is whether the reviews are simply false (warranting a response + Google action) or citing such defamatory or illegal practices that you should consult with a lawyer before taking any further action. Our real-world example is of the former kind — it illustrates what a fake review might look like with sentiment that is negative but not accusing the business of criminal activity. If research has made you aware that a review has been left by a competitor or by someone who is not a customer, that’s a violation of Google’s Review Policy. First, leave a brief owner response to the review (as shown in my sample response below) to alert consumers to the falsity of the review. Note: I don’t advise ‘outing’ the bad actor — it’s not professional. Second, follow Google’s steps for flagging the review. I suggest waiting 24 hours after doing this before moving on. Next, on that same page, you will see options for speaking directly with Google via phone, chat, or email. Contact Google to let them know about the fake review you have flagged. Hopefully, they will be able to rectify this for you and remove the review. However, if you get a rep who doesn’t seem to understand your issue, turn to the Google My Business Community, post the complete details of your scenario, and beg for a Top Contributor to help escalate your issue. Don’t expect a quick fix. You may have to be persistent to obtain resolution. 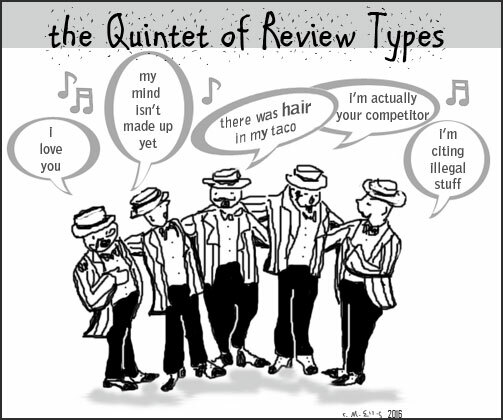 But, again, please don’t take these steps if a review accuses your business of something illegal. We’ll cover that, below, in Type 5. Sadly, after researching this, our company discovered that this review was left by a competitor. We are taking the appropriate steps to report this to Google, and we hope having this fake review removed will encourage this unfortunate competitor to seek other, more honest forms of promoting his business. If he persists, we will engage appropriate legal counsel. Diagnosis: Whether a negative review is true or false, any time illegal or dangerous behavior is cited, it’s a cue to you that you need to speak with an attorney before taking any further steps. Don’t respond and don’t attempt to have the review removed, as both could be used as evidence in a court of law. Seek an attorney well-versed in cyber law and act on his or her advice, rather than on any advice you may read on the Internet or receive from marketers, friends, etc. And if you run an SEO agency, I urge you not to advise clients on Type 5 reviews — we’re SEOs, not attorneys, and shouldn’t be consulting on legal matters. Observe the typical rate at which you normally receive reviews. It could be a few per week, or if you’re managing multiple locations, numerous reviews per day. What you observe dictates how frequently you need to monitor your reviews. If you’re a Moz Local customer, we’ll conveniently alert you as each new review comes in, and you can check that as often as makes sense. Avoid unnecessary customer frustration and bad reviews stemming from bad data. There must be literally millions of negative reviews on the web citing wrong phone numbers, wrong hours of operations, wrong addresses. Do a quick citation health check to see if your major local business listings are fomenting negative sentiment. Correct problems. I’ve seen various theories about how quickly an owner should respond to reviews; my own opinion is ASAP, particularly when it comes to Type 2 and Type 3 reviews. If you are trying to catch complaints for the purpose of resolving them and winning back unhappy customers, there may be circumstances (like our example with the puppy shots) that make it vital to respond quickly to avoid customer loss. While it may be ideal to have owners be the authors of all owner responses, scale may make that an untenable situation. If you are designating a staff member or marketer to represent the owner, prevent mistakes by clearly outlining company policies, voice, permissions, and objectives with that person. Responsiveness can be a competitive difference maker. Observe your direct competitors; if they are careless about active management of reviews, you can take advantage by making your brand the one that always responds, demonstrating care and accessibility. Know that expert owner responders experience thrilling victories, like having an unhappy customer update their review and raise their star ratings after receiving a great owner reply. These are rewards that make the input of effort well worth it! Six years into Google’s rollout of the owner response function, I still encounter many business owners expressing fear of reviews. At the root of this, I often find that they feel powerless and overwhelmed by the prospect of managing their brand’s reputation. It’s my hope that this post signals to every local business owner that you do, indeed, have significant power in this regard. Via the the right combination of skilled customer service and active review management, you can orchestrate an exceptional online reputation for your brand in concert with your customers, in harmony with your professional goals and dreams.